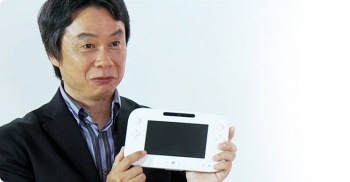 The Wii U was long in development before Apple revealed its iPad, says Nintendo boss Satoru Iwata. When Nintendo unveiled its new console yesterday at E3, some people were quick to call it as they saw it - as the hypothetical love-child of the Nintendo Wii and the Apple iPad. After all, it did look like the Big N had just plunked a tablet PC down and turned it into a controller, didn't it? That isn't the case at all, said Nintendo's CEO Satoru Iwata in the E3 edition of Iwata Asks. According to Iwata, development on the Wii U had started three years ago in the distant era of 2008 - long before the iPad and the recent tablet PC boom. It just so happened that between the first Wii U meetings and its reveal, the iPad and other tablets really took off. "[Because] people outside the company do not have an insight into our development process," said Iwata, "when people see this for the first time in 2011 when this is revealed, they might think, 'Oh, Nintendo is going to add a tablet to their console.' I think that's how people may see it." He isn't wrong - that is how people may see it. Iwata said that something similar had also occurred with the 3DS launching amidst the 3D "fad." "We release something after much internal debate and development, and that release timing happens to be when something like that is extremely popular. I feel like that has been our trend lately." Shigeru Miyamoto noted that while holding the controller vertically made it feel more like a tablet, holding it horizontally made it feel more like a giant DS, where the TV was the top screen. "It's more about the value of having a screen in your hands for a video game," said Iwata, "and we were focusing on how you are able to do quite a few things without turning the TV on." I don't think Iwata is wrong here - the Wii U clearly had a long development time, and while tablets were around back in 2008 it wasn't until the iPad that they really became part of the public consciousness. I also think that no matter what he says - no matter if he's right or not - that people are just going to look at the Wii U's controller and think "Oh, that's a tablet."